I heard the unmistakable sounds of a pack of Harleys coming up the road and was reminded it is Bike Week. When we say bike, we mean motorcycle and even though there are countless brands and types of motorcycles in existence, by bike, we usually mean Harley. Harley-Davidson is the quintessential American Motorcycle and an iconic brand that has done an amazing job of maintaining its identity for 107 years. Harley has managed to survive just about every turn in fashion and economy and roar out the other side just as strong with all its muscle and identity in place. It is a brand that has gone through many changes over the years but the transitions appear seamless. Even through bouts of image and reliability issues the Milwaukee motorcycle company has always had a loyal customer following - that base and the brand is bigger than ever. 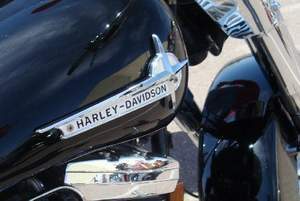 The Harley-Davidson logo can be seen on just about every kind of product and accessory for bikes and riders. 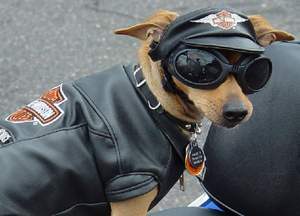 Sure there are leather jackets, chaps, helmets and T-shirts but also baby clothes, beach towels, boxers and dog bowls. You name it, you can find it with the distinct orange and black H-D emblem. If you need a four- wheel vehicle to go along with your bike; the Ford Harley-Davidson truck might be the 'ultimate' Harley accessory- the 2010 Harley-Davidson badged Super Duty lists for $56,900. 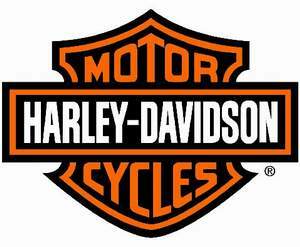 There is some great product branding around but few company logos are as recognizable as Harley-Davidson. What other consumer brand do you see tattooed on people's bodies? That's customer loyalty! 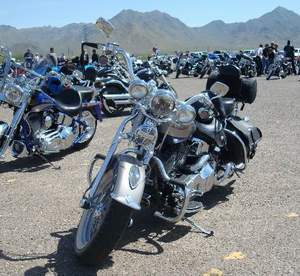 Bike week in Arizona will bring about 50,000 motorcyclists to a collection of enthusiast geared rides and rallies. 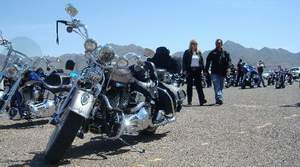 Attracted by the wide, dry roads and clear desert skies; the bikers will come for the weather and stay for the events. The events that bring bikers from all over the world include everything from Charity Poker Runs, Bar Bike Nights, and Biker Rodeos to Beauty Pageants. The trick of promoting these events lies in having lots of biker-friendly venues, daylight and nightlife options-events that are organized... yet don't seem that strictly run. After all, the whole idea of getting out on the open road on your Harley is to express yourself and demonstrate a sense of freedom. Rallies in all the United States and all over the world have managed to find the perfect biker balance and attract huge followings. 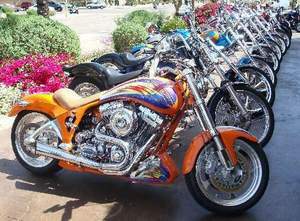 Daytona Bike Week is the biggest biker festival that brings an estimated attendance (over 10 days) of 600,000 bikers to the Florida shores every winter. 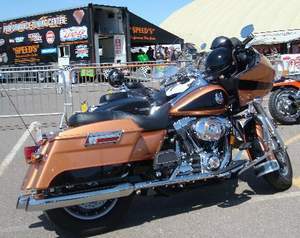 (Since 1937) Daytona Bike Week is mainly Harleys and also has a huge sport bike crowd. Daytona is a Mecca for motorcycle racing and during Bike Week you'll see drags, flat track, Motor GP, Grand Prix and every class of sport bike to Superbikes negotiating the high banks of the Daytona International Speedway. The Sturgis rally is less about racing and beach bars than Daytona. Known for great riding through the western states, Black Hills are a great start for daily destinations to places like, Devils Tower in Wyoming, Custer National Park and Deadwood. During the summer months there are bike weeks all over the country but the American Harley has a borderless cult following (in '09 European Bike Week held in Austria had an attendance of 75,000) organized by and for enthusiasts. If you have heard of HOG events: that means the Harley Owners Group. With millions of riders out there a lot of the biker reputation of being outlaws and Hells Angels has faded and the swarms of weekend warriors and the ones we call RUBS (Rich Urban Bikers- the Doctors and Lawyers who join the fray) populate the Bike Week events. 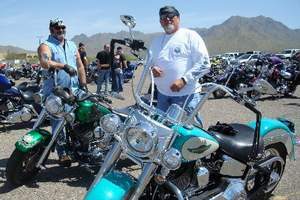 They are welcomed by communities where they bring in billions of dollars in motorcycle event related revenue each year. They may all be 'Born To be Wild' but all those leather clad, sunburned visitors have to eat and drink at restaurants and sleep in nice hotels. 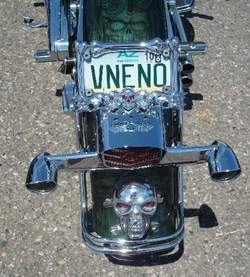 This affluent crowd has spent plenty personalizing their Harley and perpetuating the brand. They will then be happy to spend their vacation and paycheque at Bike Week. They roar through the streets, maybe stop long enough to buy another tank of gas, and then hit the open road on their Hog.